The air around us is made of many different gases. The main gases are nitrogen (78%), oxygen (21%), argon (0.93%) and carbon dioxide (0.04%). When we measure gases, we are often interested in their concentration. Concentration is a measurement of a specific amount of matter, such as carbon dioxide (CO2), in a given volume. The unit of measurement often used for the concentration of a gas is parts per million (ppm). For example, a concentration of 1 ppm of carbon dioxide would mean that there is 1 L of carbon dioxide in 1 000 000 L of air. Sometimes we measure gases using millimetres of mercury (mmHg). This measurement is taken using a thin u-shaped tube filled with liquid mercury. The greater the downward force from the carbon dioxide (or other gas) on the mercury, the higher the mercury will rise in the tube. To determine the concentration of carbon dioxide, you would use a device called a carbon dioxide meter. 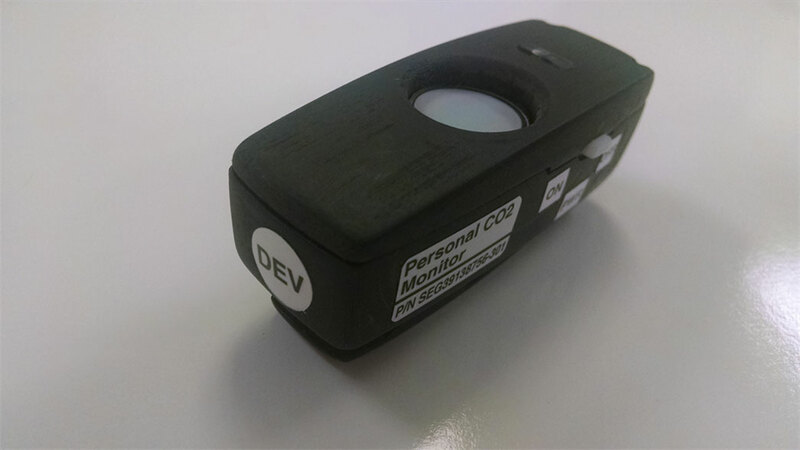 A carbon dioxide meter has a device that can sense the number of carbon dioxide molecules in the air (CO2 sensor), and a screen that shows the concentration of carbon dioxide in ppm. Carbon dioxide in our atmosphere comes from many sources, both natural and human-made. Nature sources include oceans, decomposing living things and respiration that happens in cells. When cells undergo chemical reactions that release energy for the cells to use, they produce carbon dioxide and water as waste. Every time we breathe out (exhale), we are getting rid of the carbon dioxide produced by our cells. When people burn fuels like wood, coal, oil and natural gas, large amounts of carbon dioxide are released into the atmosphere. The carbon dioxide level outdoors averages around 300 - 350 ppm. The carbon dioxide level indoors can be much higher. Imagine your classroom. During the day all of students and the teacher are exhaling. All this exhaling can lead to a lot of CO2 in the room. If the CO2 cannot escape, such as through a window or the school ventilation system, it will build up over time. As the carbon dioxide level goes up in a room, the oxygen level goes down. When less oxygen gets to your brain, you can feel it physically. At around 1 000 ppm CO2 you may start to feel tired. Headaches, dizziness, tiredness, and trouble breathing can happen when the CO2 level rises above 2 000 ppm CO2. Above 5 000 ppm even more dangerous health effects can happen. When less oxygen gets to your brain it can also affect how you think. When carbon dioxide levels go up, you may find it hard to pay attention to the teacher, or to do focused tasks such as adding a column of numbers, or finding mistakes in your writing. So, what is the optimal or ‘best’ range for carbon dioxide in a classroom? The short answer is – the lower the better! Sources vary in what level they recommend, but ideally a classroom CO2 level should not get higher than 800 - 1000 ppm. Maintaining a breathable atmosphere on a spacecraft is not an easy task! In a closed environment like the International Space Station (ISS) controlling the level of gases such as carbon dioxide (CO2) is really important for keeping astronauts healthy and safe. Unlike on Earth, astronauts cannot open a window or step outside for a breath of fresh air! Almost all of the CO2 on board the ISS is produced by the astronauts’ breathing. Carbon dioxide levels are monitored and controlled on the ISS by the Atmosphere Revitalization (AR) subsystem of the Environmental Control and Life Support System (ECLSS). NASA has set the maximum allowable 24-hour average CO2 on board the ISS at 5 250 ppm (4.0 mmHg). There are a number of sensors at different places inside the ISS that monitor CO2 levels. To remove CO2 from the station’s atmosphere, air is blown over a bed of rocks called zeolite. Water and CO2 stick to the zeolite, but everything else passes through. The water is recovered for recycling, but the CO2 is blown out of the station. This means that a small amount of the station’s air is lost every day. Circulation of air is an important part of controlling CO2 on the station. Because air does not circulate in microgravity the way it does on Earth, pockets of CO2 can build up in parts of the ISS. This build-up can be hazardous to astronauts. For instance, a bubble of CO2 could form around an astronaut’s head as he or she is sleeping, which would lead to a lack of oxygen. Astronauts always make sure they have fans blowing on their faces when they sleep. There are fans all over the ISS that are always moving air, but they can’t completely stop the pockets of CO2 from forming. Research on board the ISS shows that astronauts are more sensitive to CO2 levels in space than they are on Earth. High CO2 levels can give astronauts headaches, dizziness, increased blood pressure, and fatigue. When they are doing complicated tasks, astronauts also make more mistakes and take longer when they have been exposed to high levels of CO2. Because of this, researchers are doing a lot of work to figure out how to monitor and lower CO2 levels on spacecraft like the ISS. Since 2016, some astronauts on the ISS have been wearing small personal CO2 sensors that use a custom board fitted with a CozIR sensor. The sensors have micro-USBs to recharge and download data. As astronauts move through the ISS, they might encounter bubbles of CO2 that sensors mounted on the station’s walls don’t measure. Astronauts’ activities like exercising or eating a meal together also affect how much CO2 they’re exposed to. Putting the sensors on the astronauts themselves give both the astronauts and researchers on Earth a better idea of how much CO2 astronauts are exposed to throughout their day as they move through the station. Astronauts can check on their CO2 levels through an iPad application, and the CO2 data is downloaded daily to Mission Control on Earth.